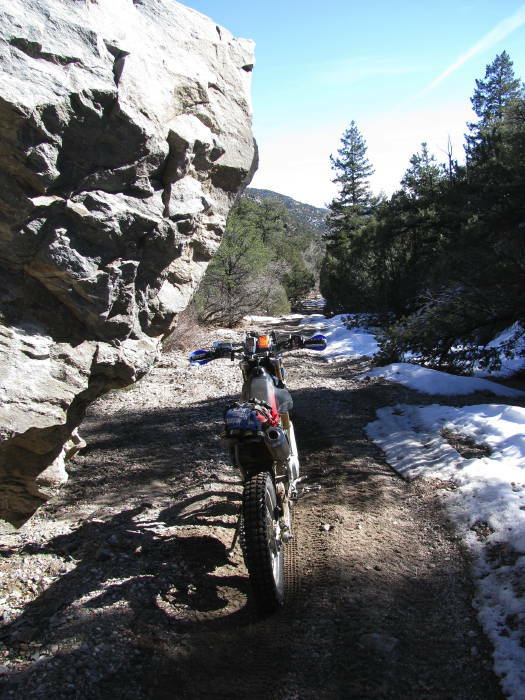 Texas Creek is a BLM-managed OHV area that has dirt roads, ATV trails, and one single-track trail. 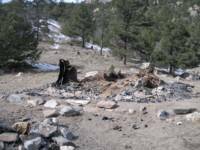 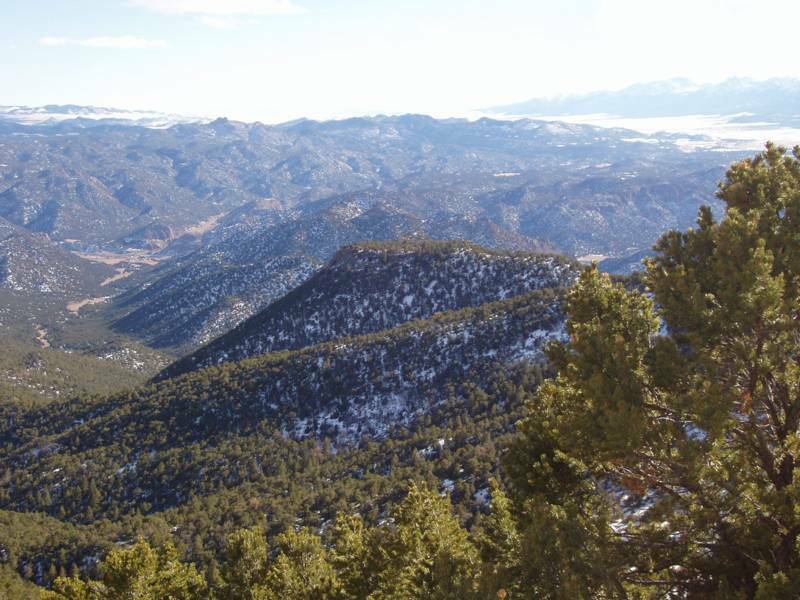 The area is about midway between Salida and Canon City, on Highway 50 about 7 miles east of Cotopaxi. 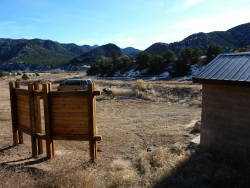 There are signs on the highway. 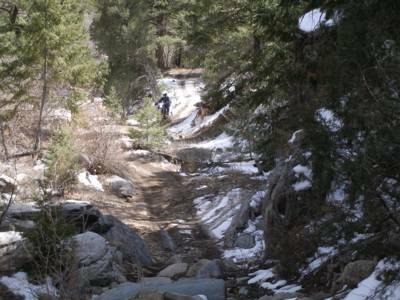 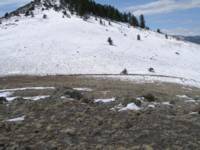 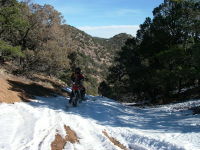 The area is often rideable in winter because it doesn't get much snow, and the snow it does get usually melts quickly. 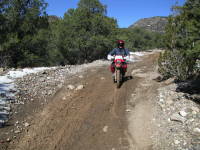 The total riding mileage is not much over 50 miles, so all the routes can usually be ridden in a day. 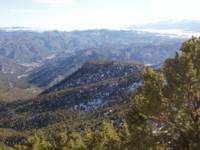 There are some mines and prospects to look at, and views from the higher hills are very good. 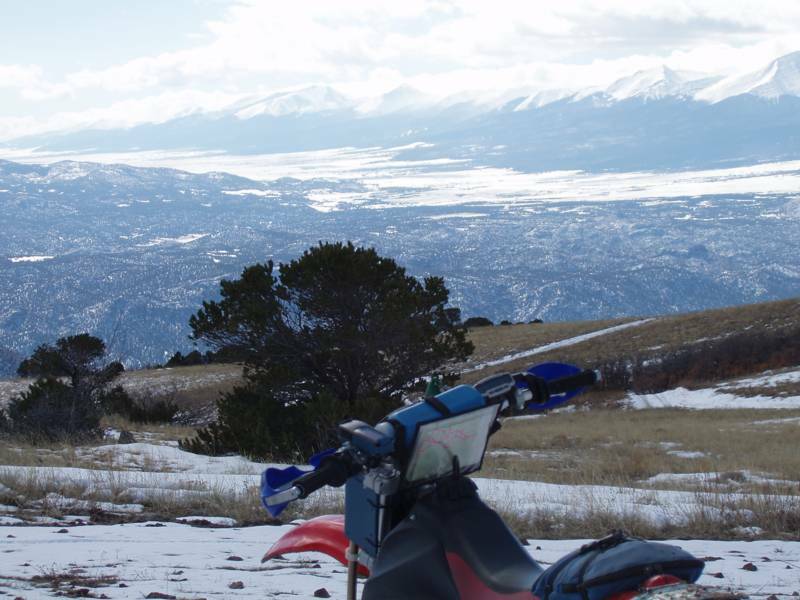 You can see most of the Sangre de Cristo Range. 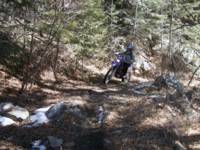 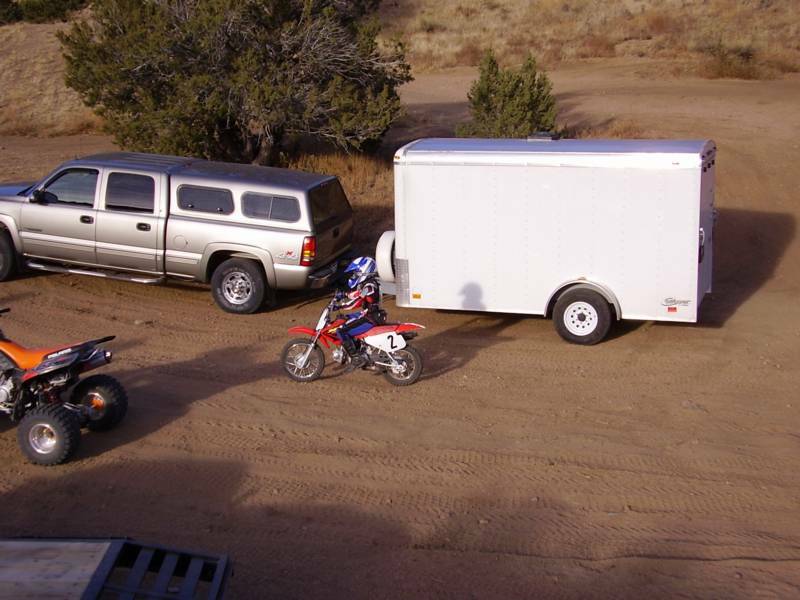 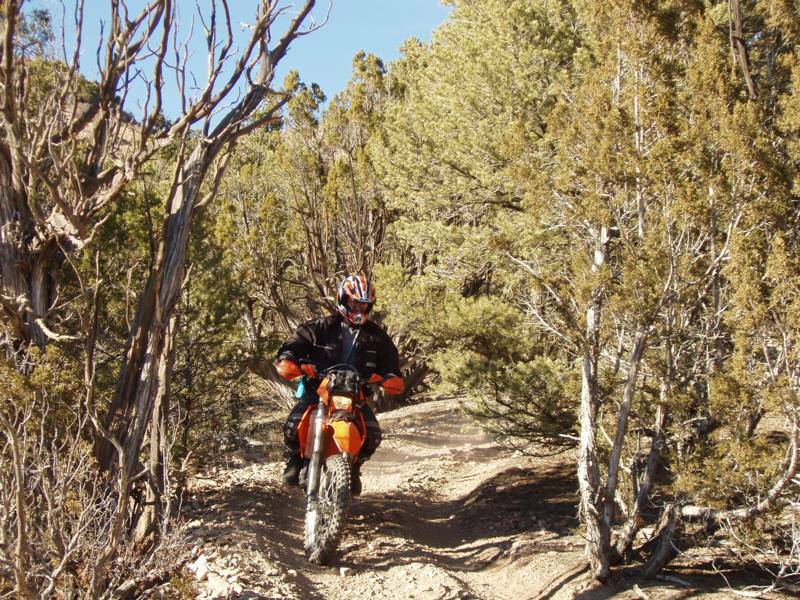 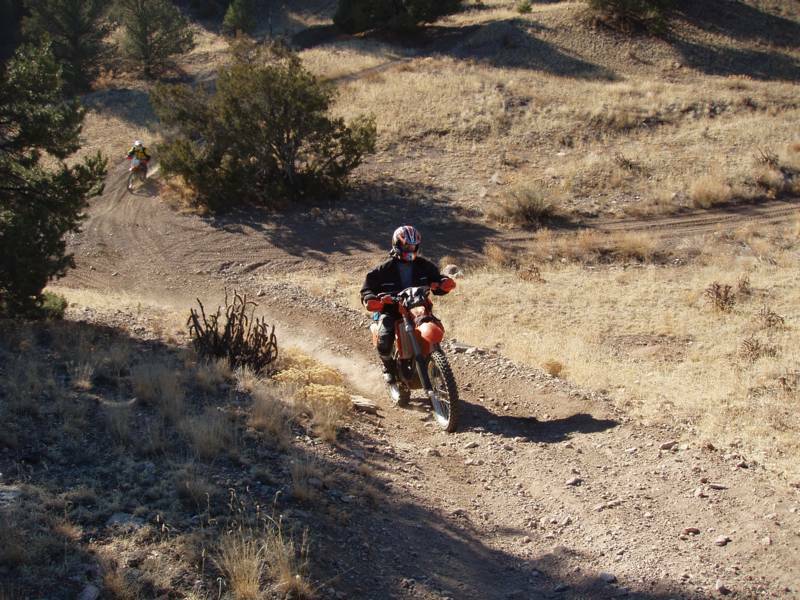 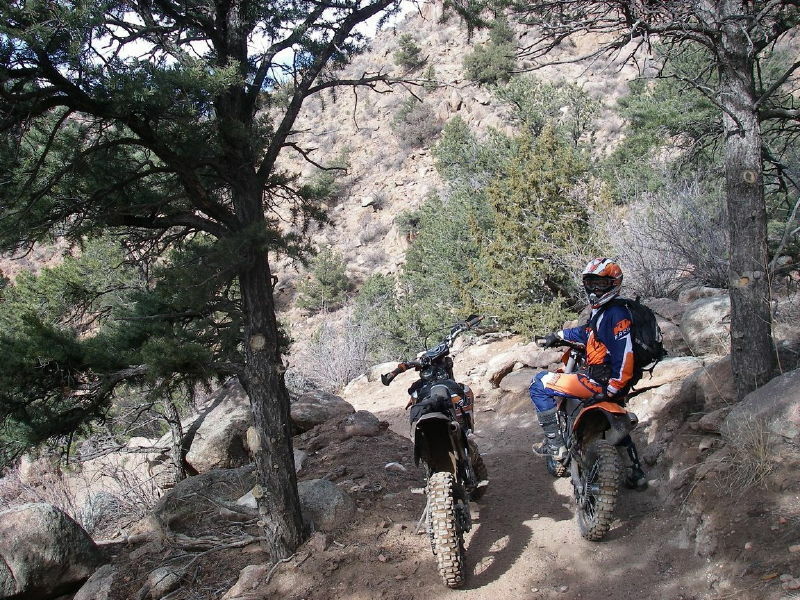 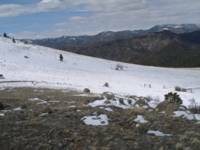 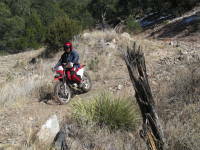 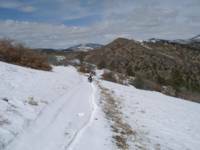 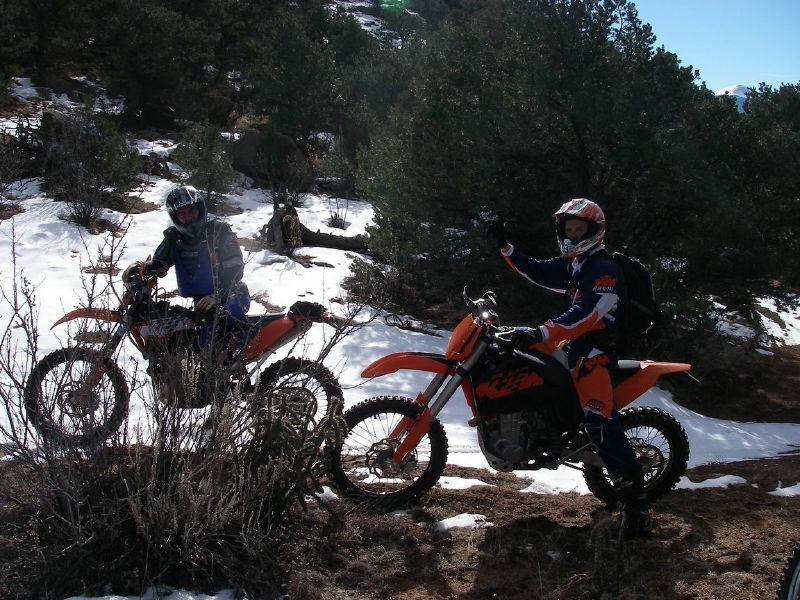 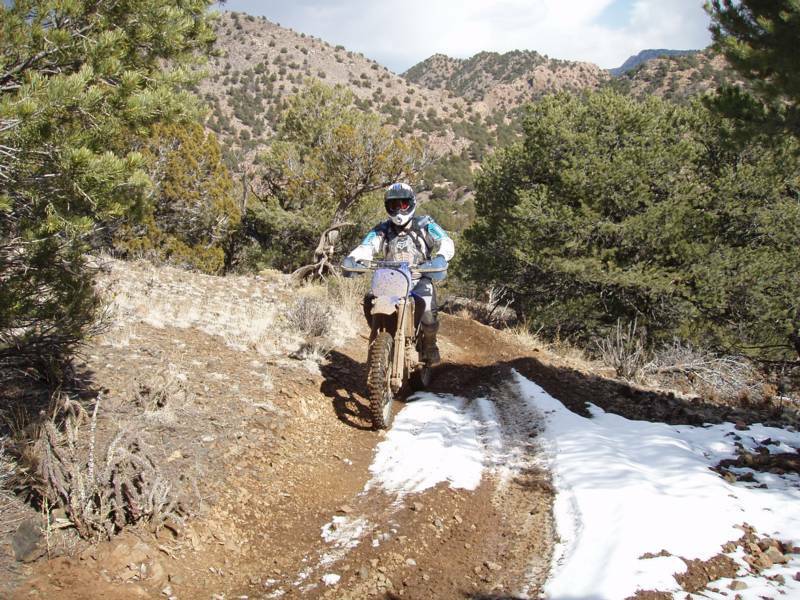 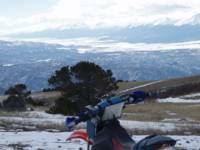 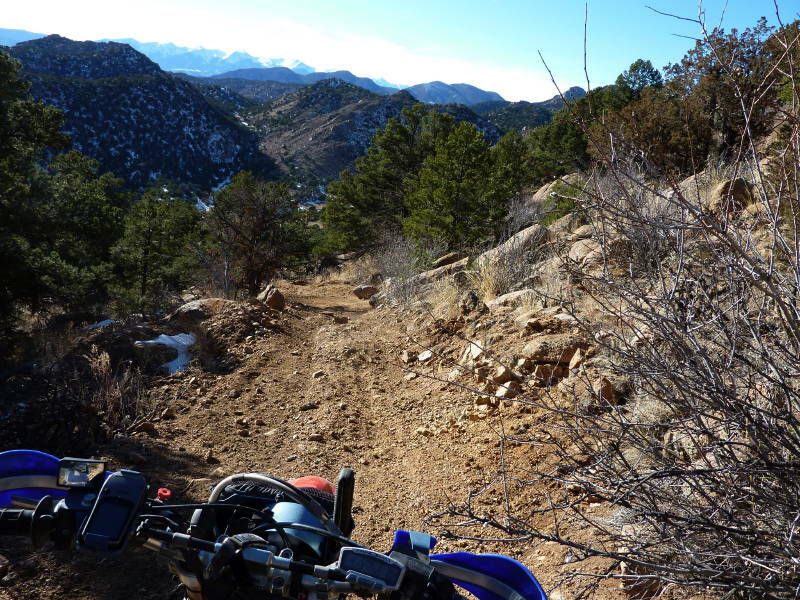 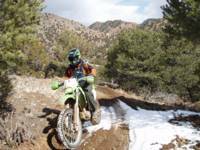 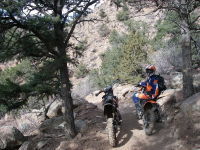 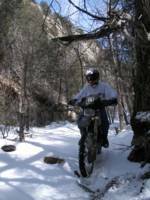 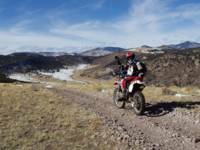 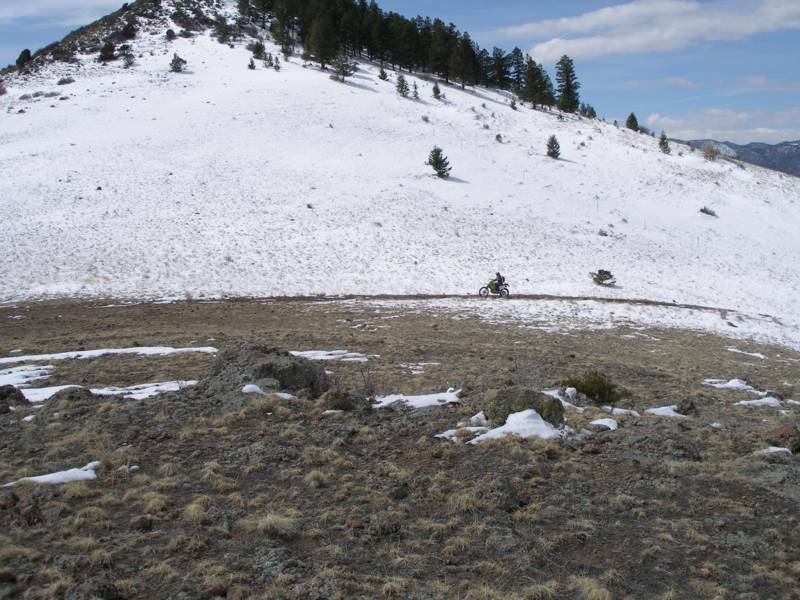 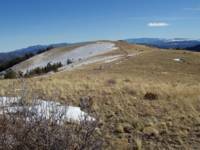 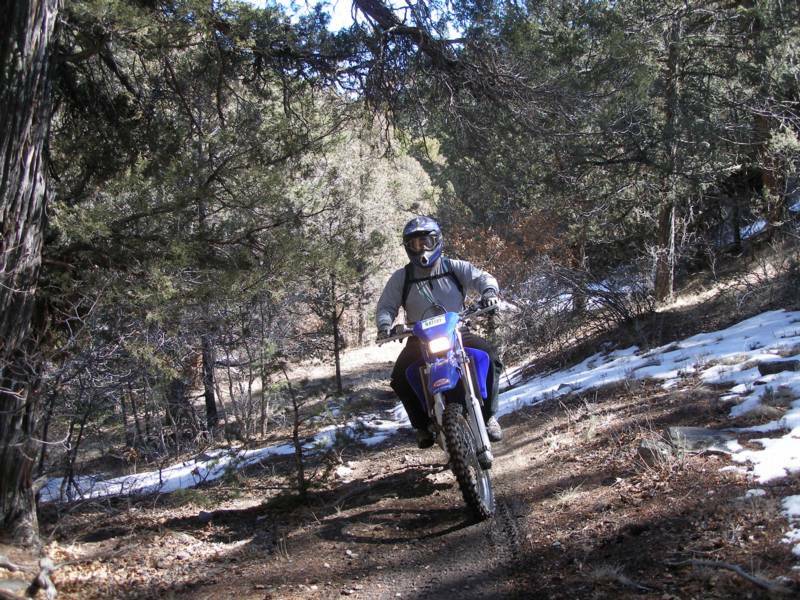 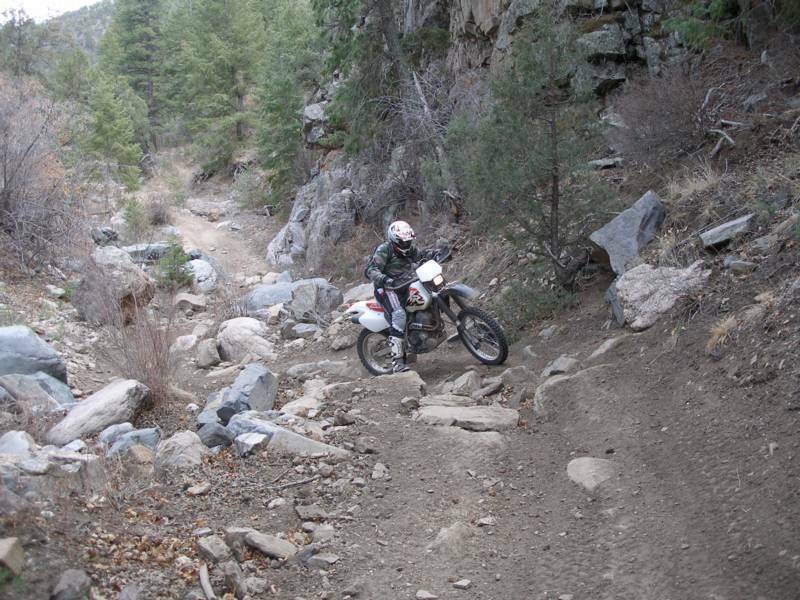 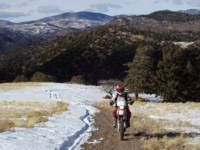 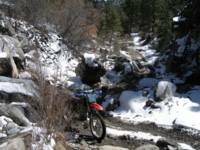 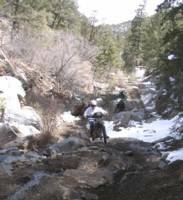 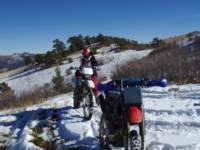 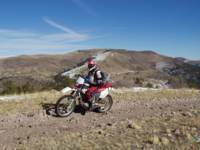 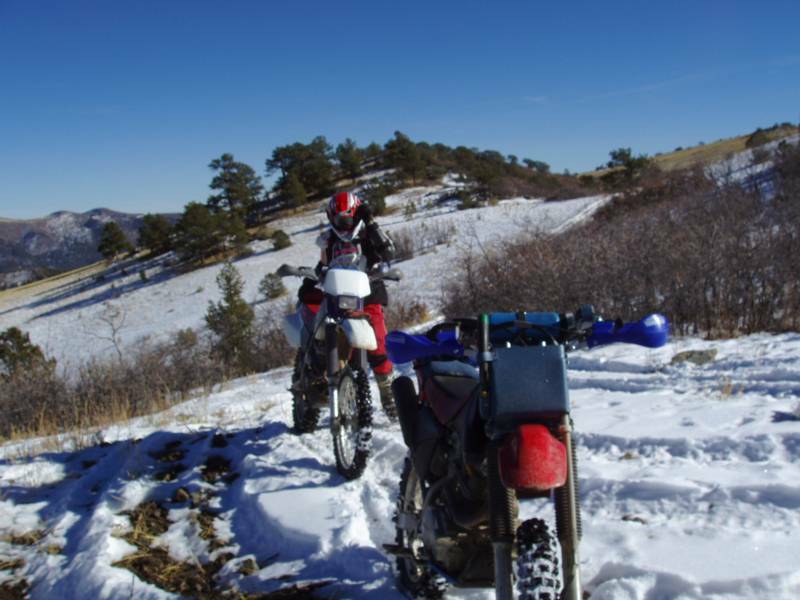 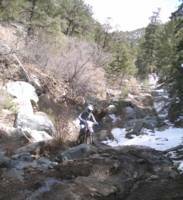 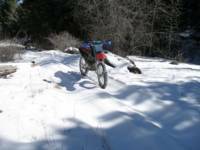 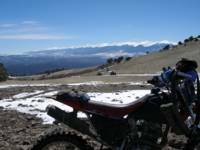 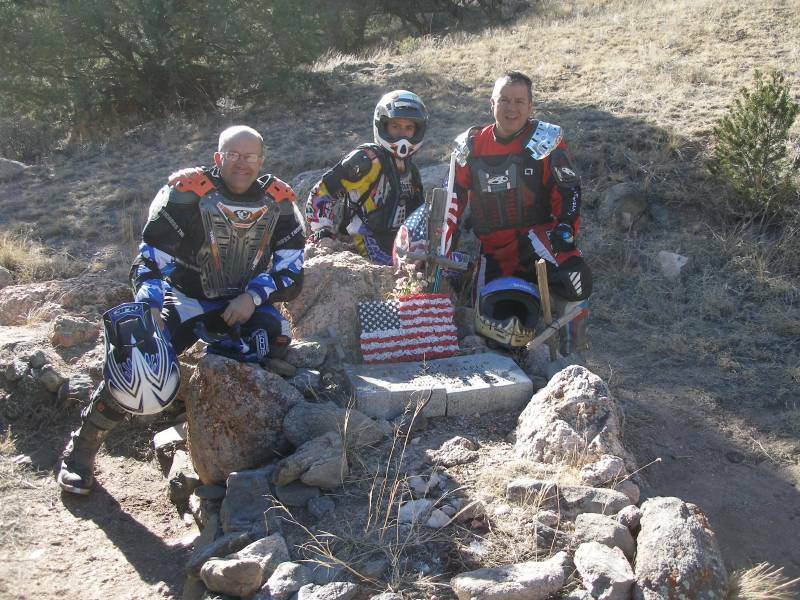 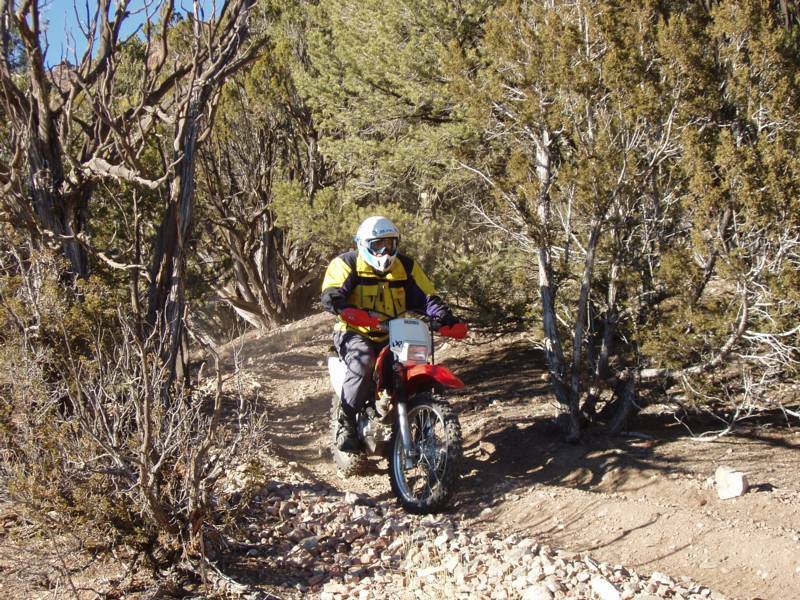 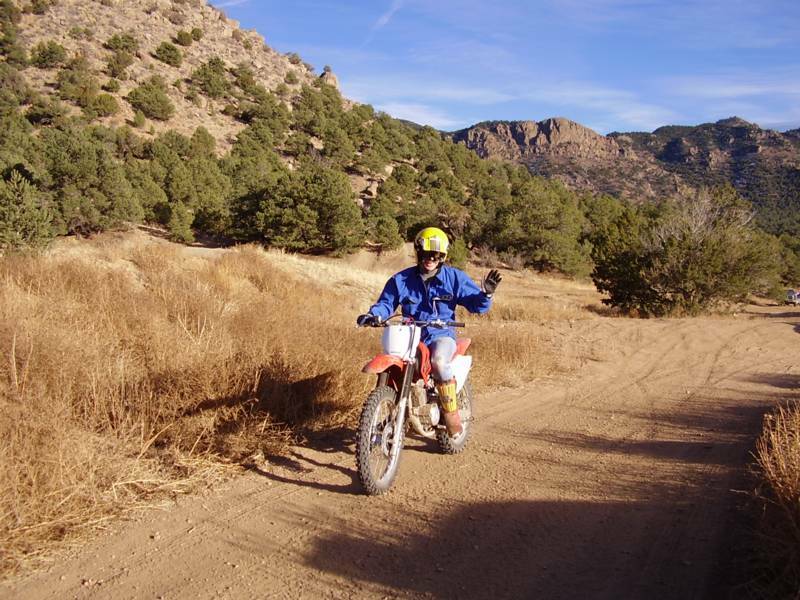 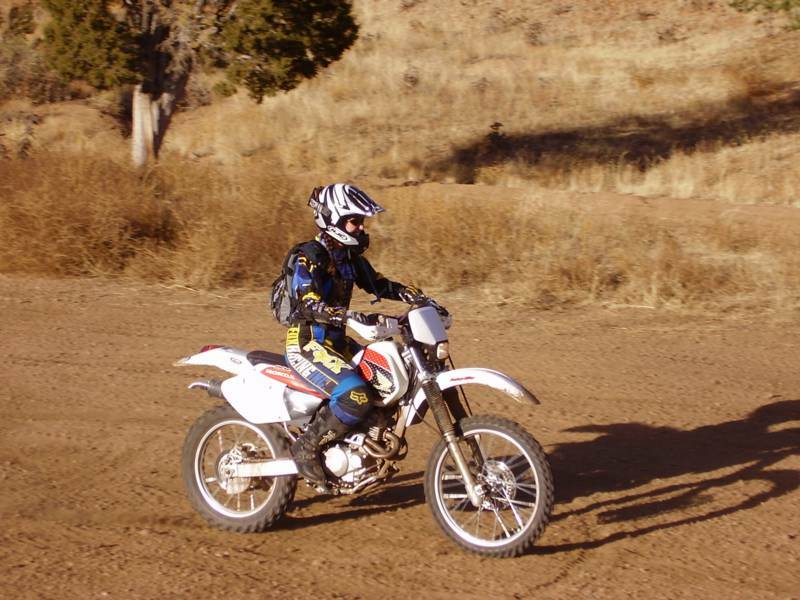 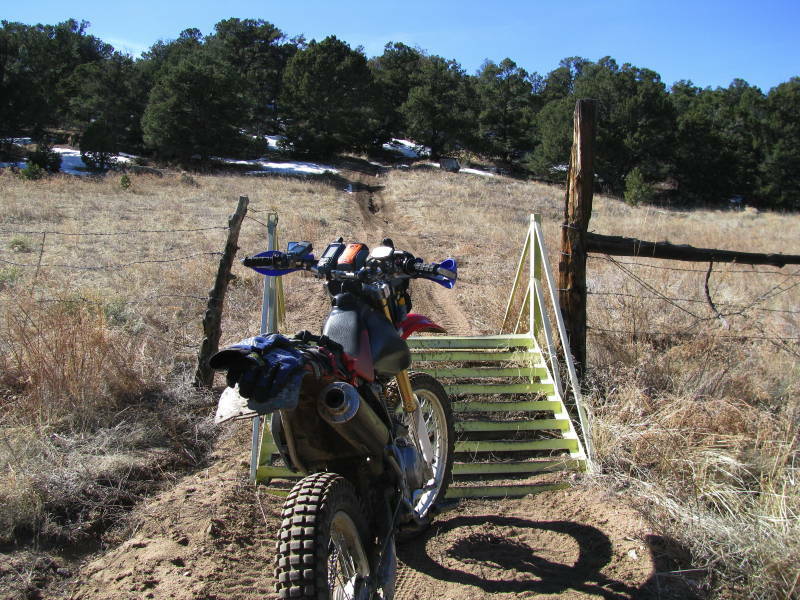 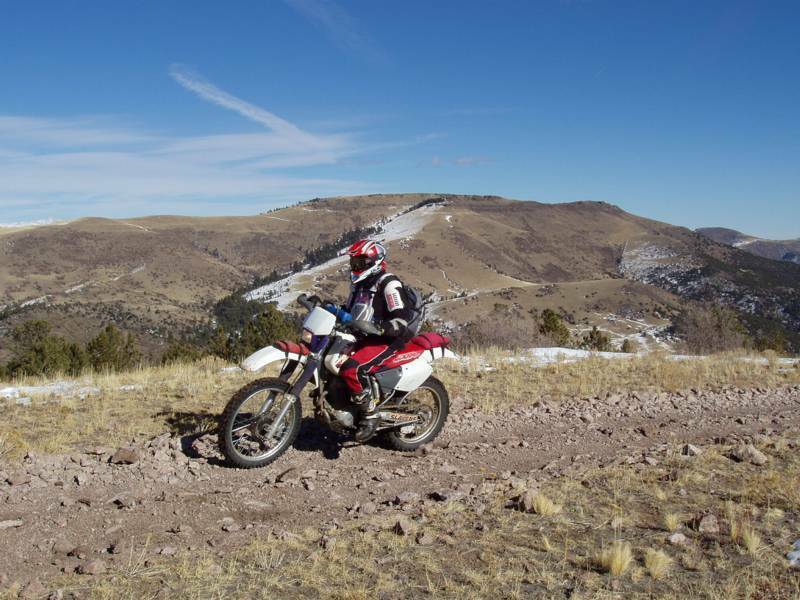 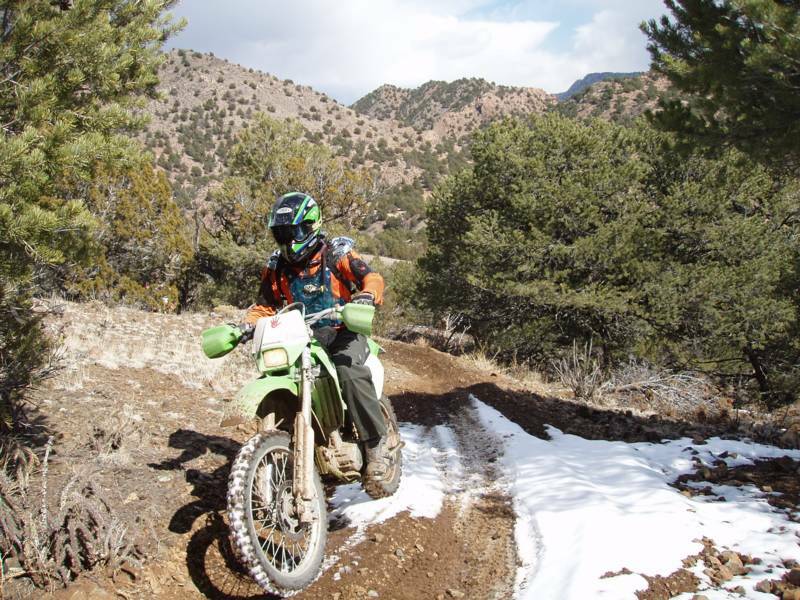 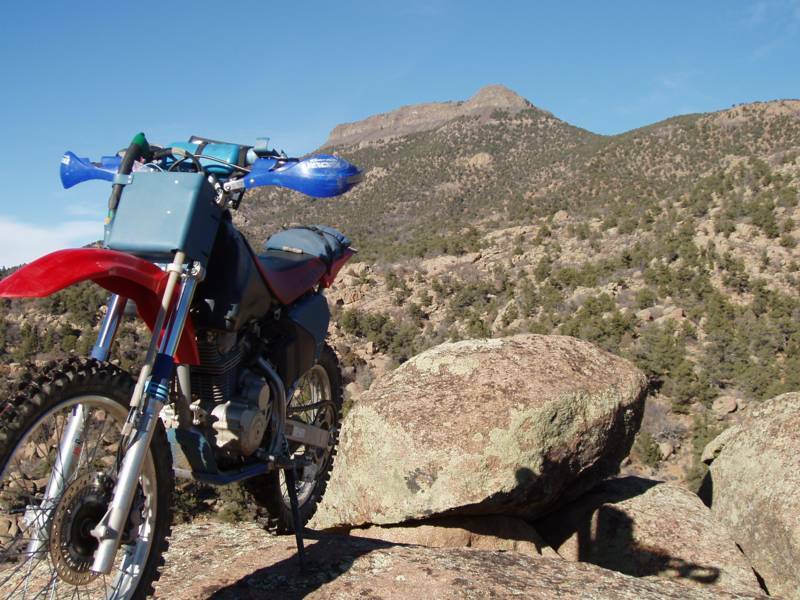 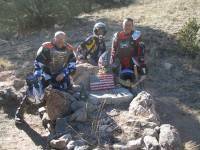 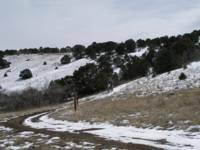 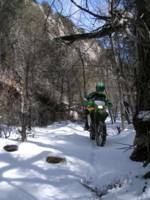 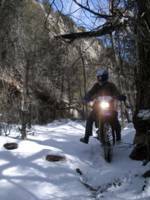 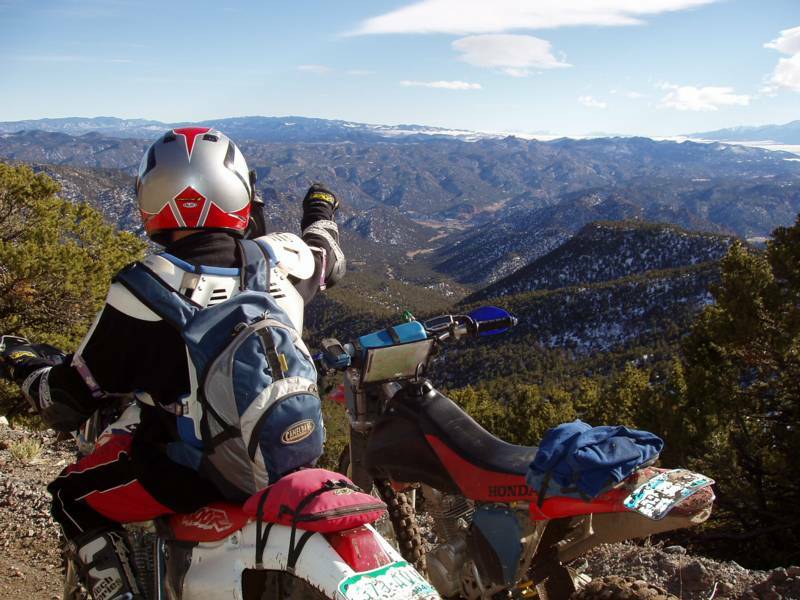 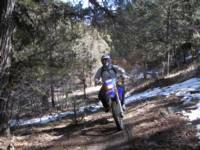 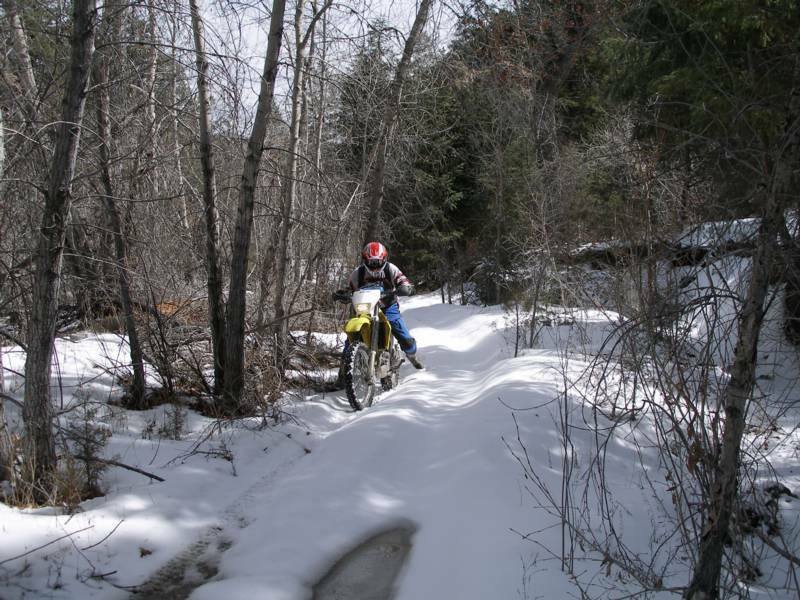 See Dual Sport Riding in Central Colorado for information about other areas and rides. 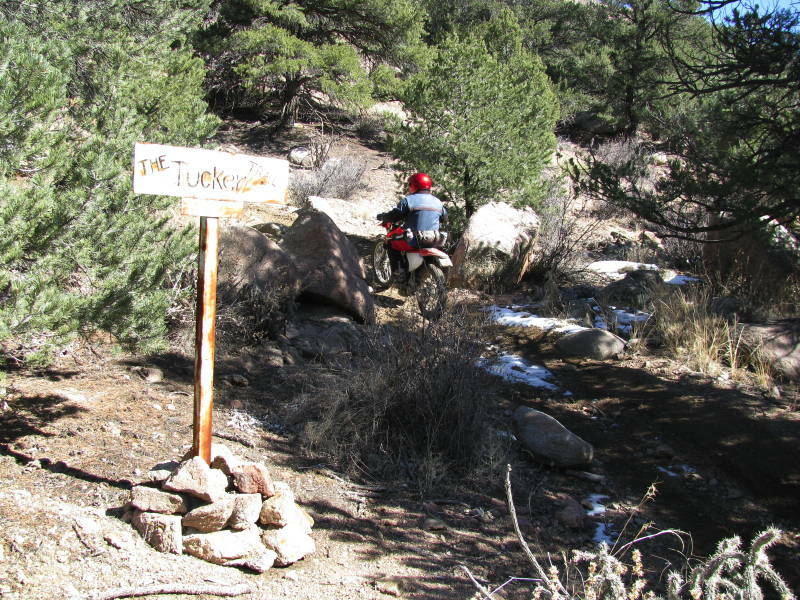 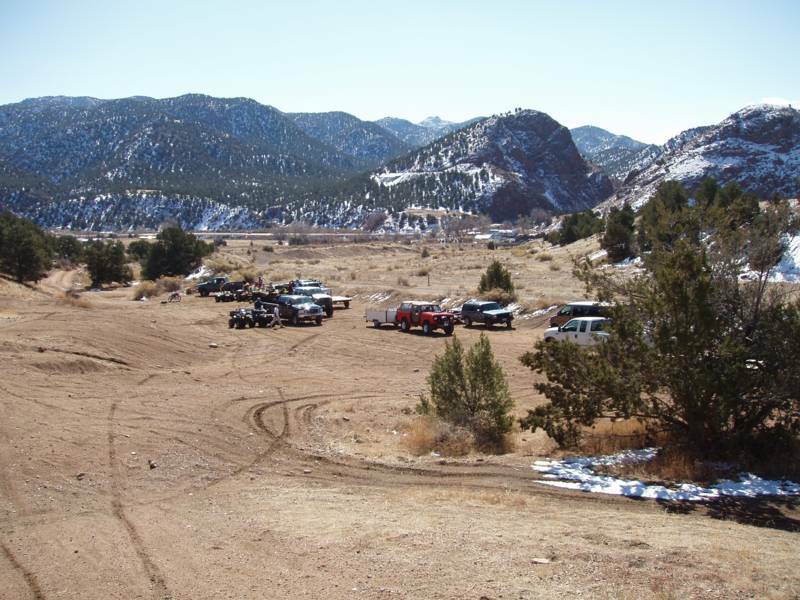 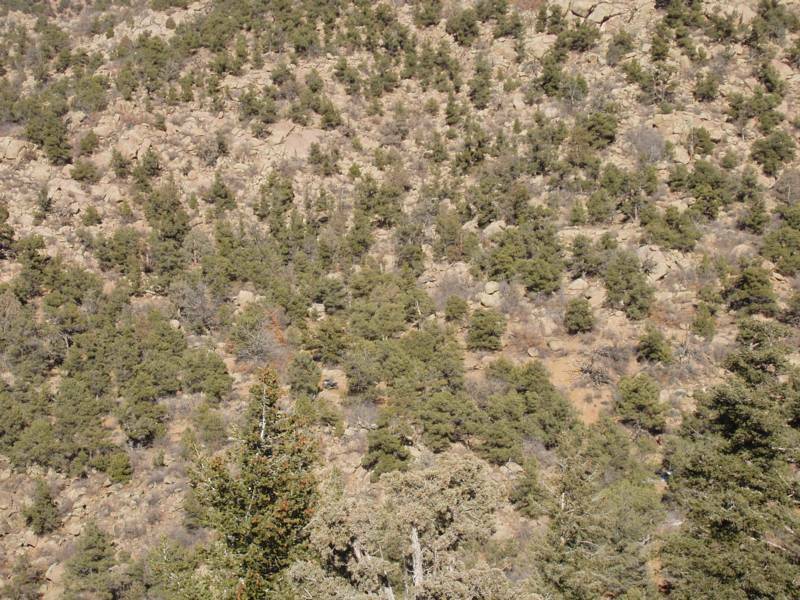 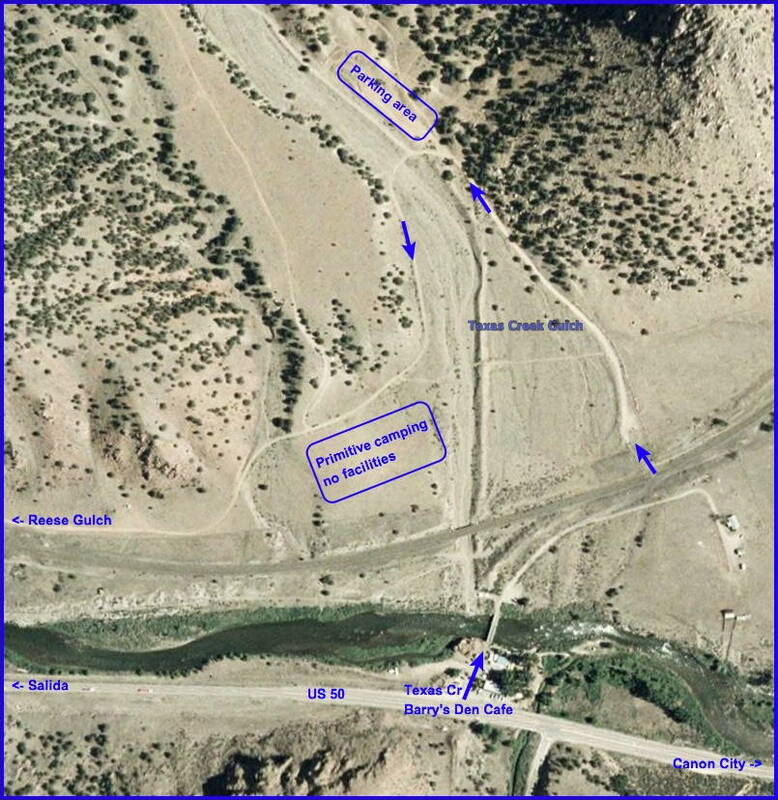 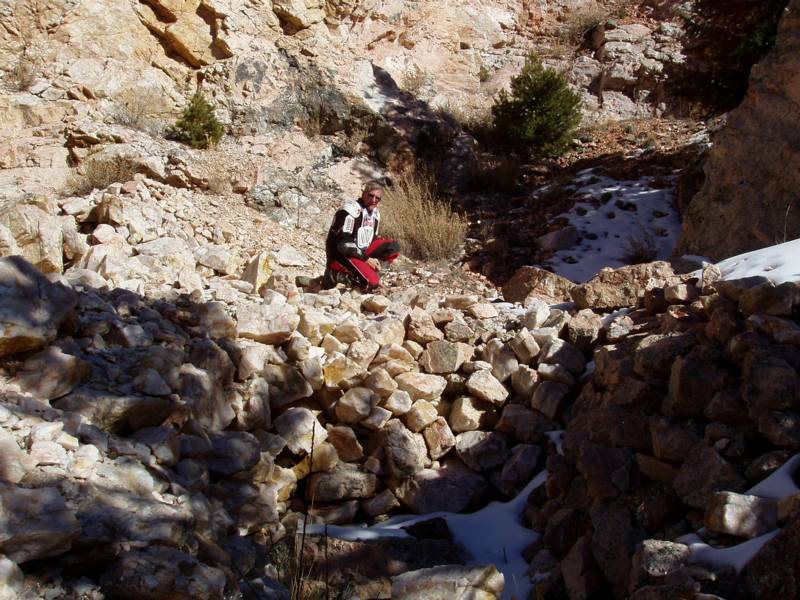 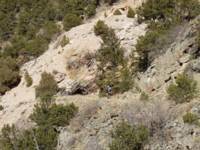 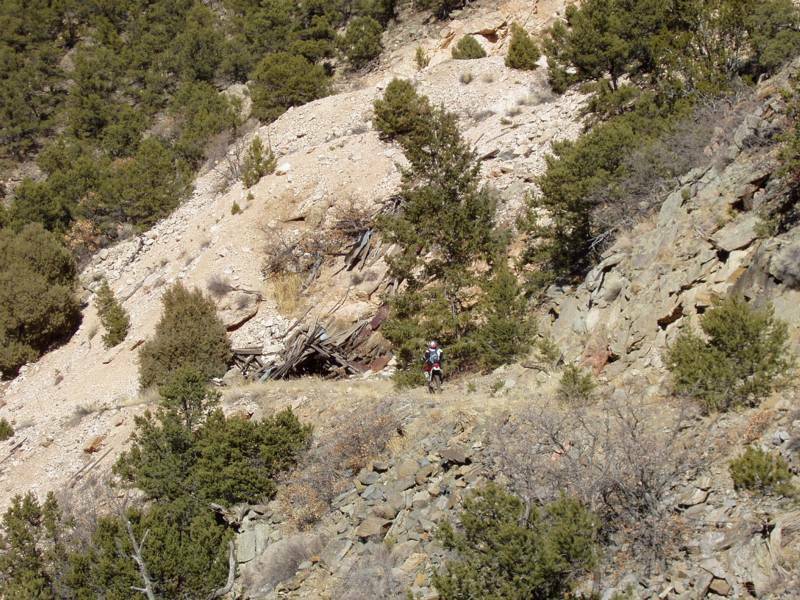 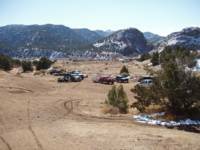 The Texas Creek Recreation area is located 20 miles west of Canon City, just north of U.S. Highway 50. 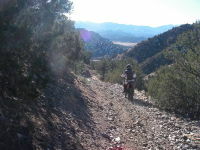 It is a popular high-use area for motorized recreation users. This area is managed under the 2008 Arkansas River Travel Management Plan. 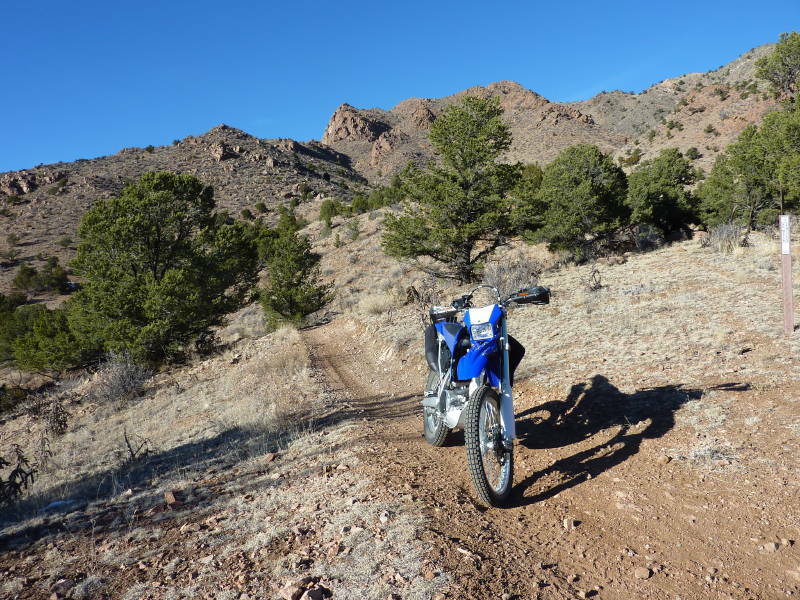 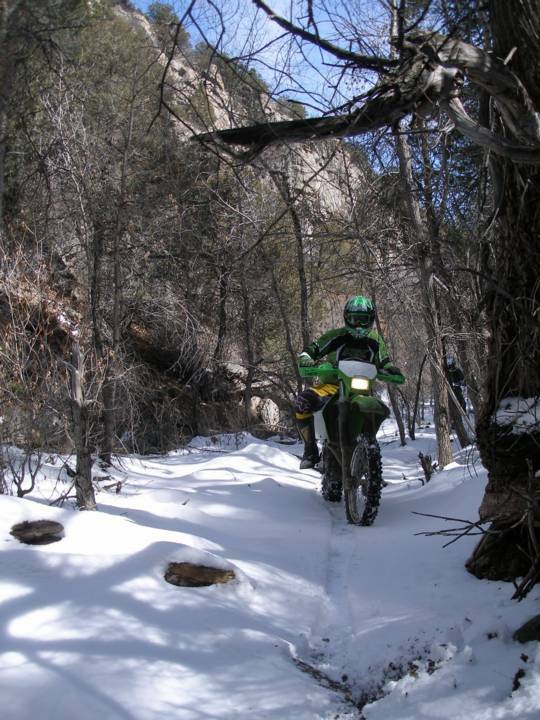 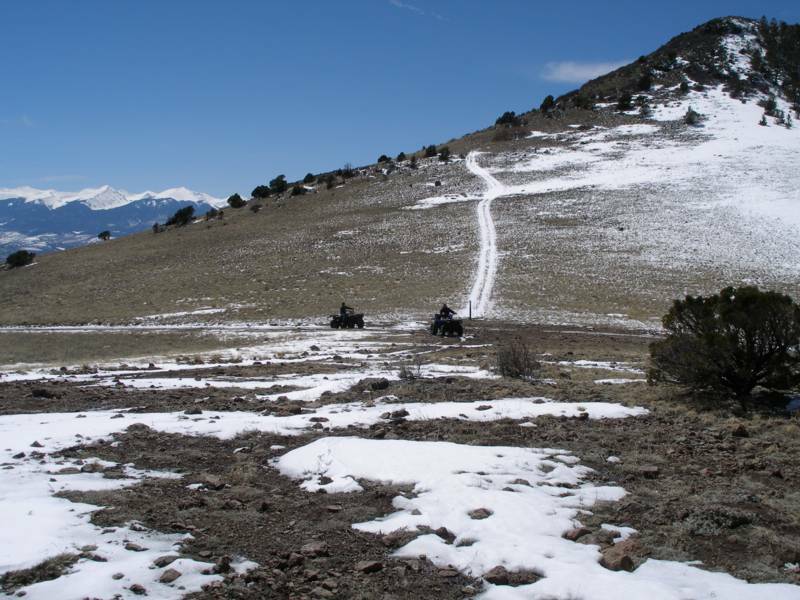 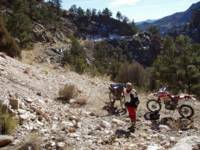 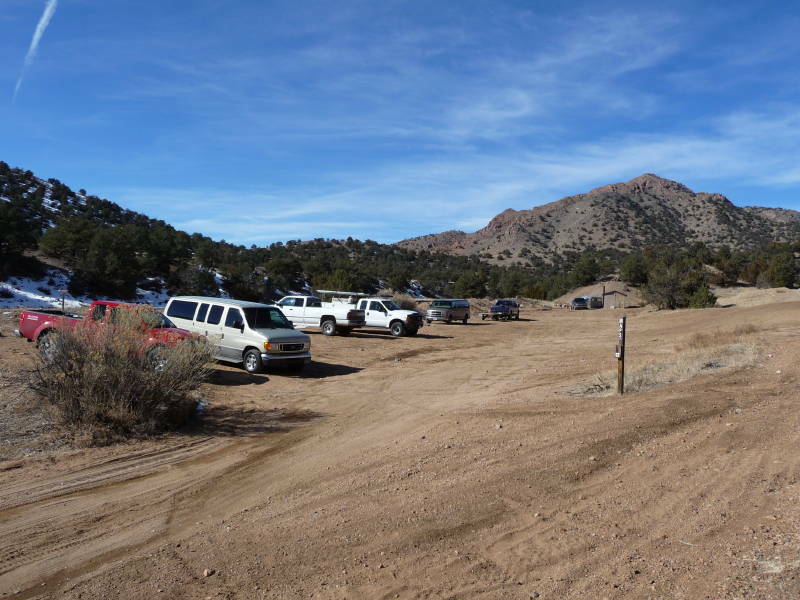 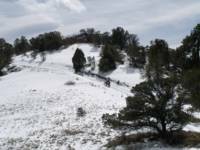 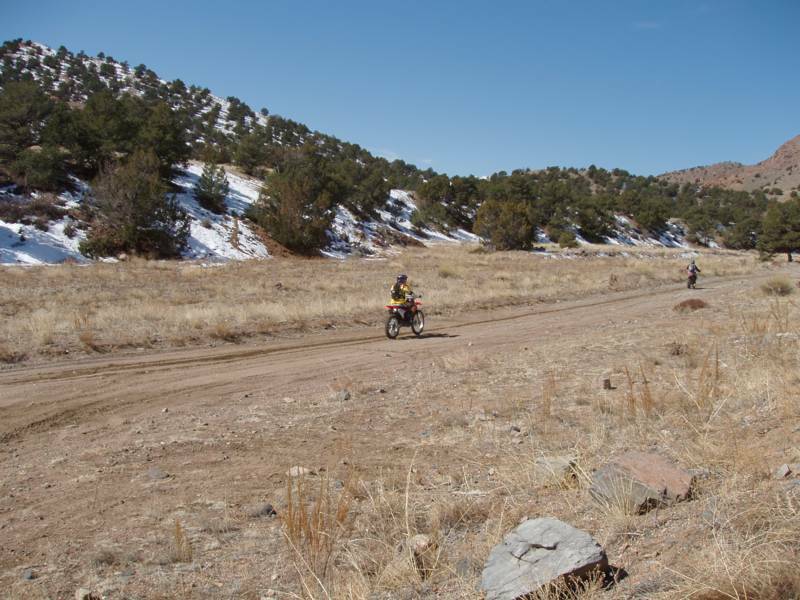 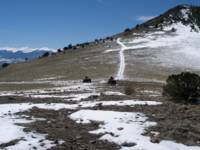 The Royal Gorge Field Office made a commitment in the plan to work with motorized trail users in the Texas Creek area to re-route unsustainable trails and identify reasonable trails to accommodate their recreation needs while protecting valued resources. 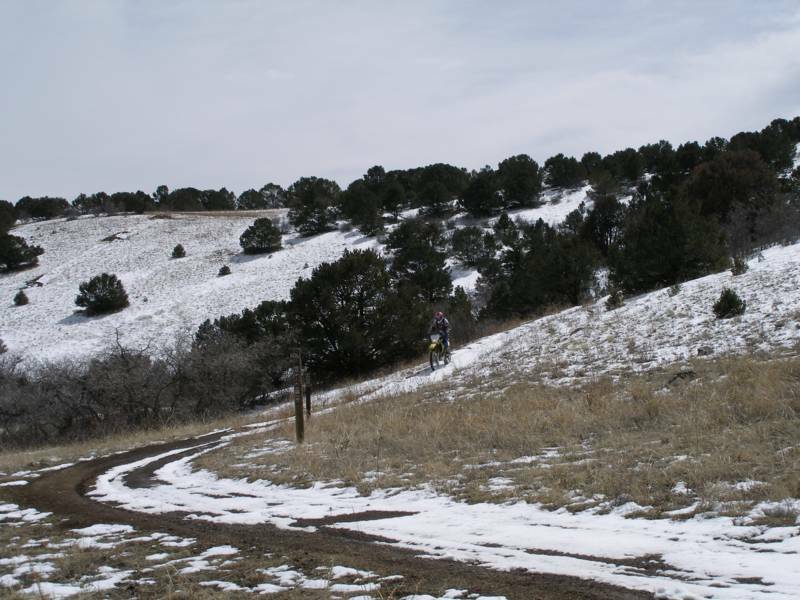 In late winter 2011, two re-routed trails were opened; a half-mile spur off of trail T6035A that leads to a scenic overlook and a 4.5-mile trail that tiers off the northern-most point of trail T6035A ending at BLM Road 6040 (Texas Creek Gulch Road). 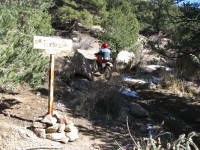 I rode at Texas Cr today, first ride of the new year. 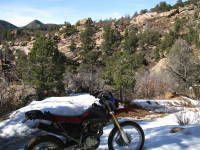 It was 55 degrees by late afternoon. 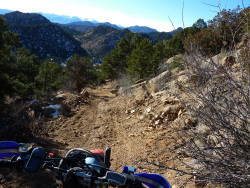 Only the lower trails were snow-free; everything up high was snowy and icy. The weekend looks like it will be very warm and I think the snow on Wed will pass Texas Cr by. 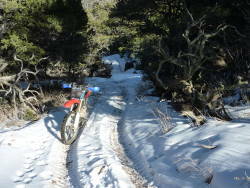 Don't let the picture fool you; although it was sunny and warmish (48), the area is really not open. The lower areas are dry, but the riding gets muddier and snowier the higher you go, and eventually snow and ice are too much. 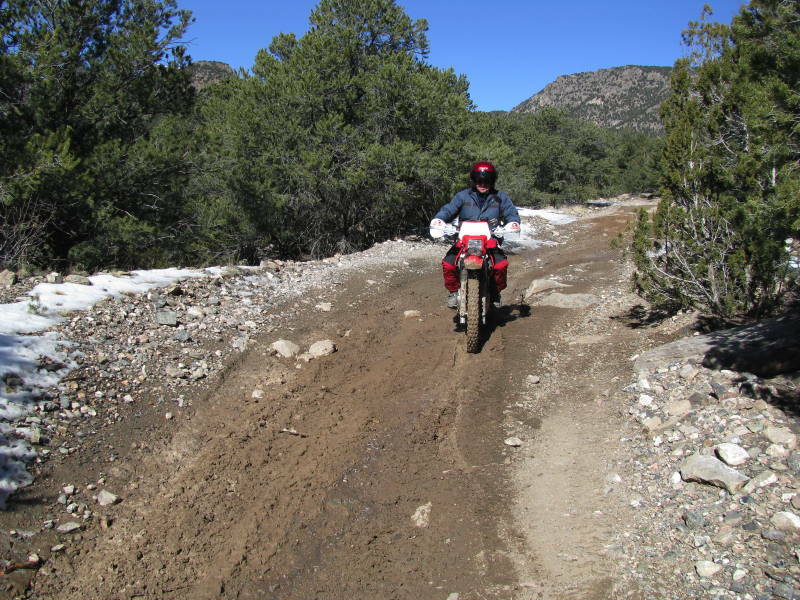 I rode 10 miles of the lowest areas. 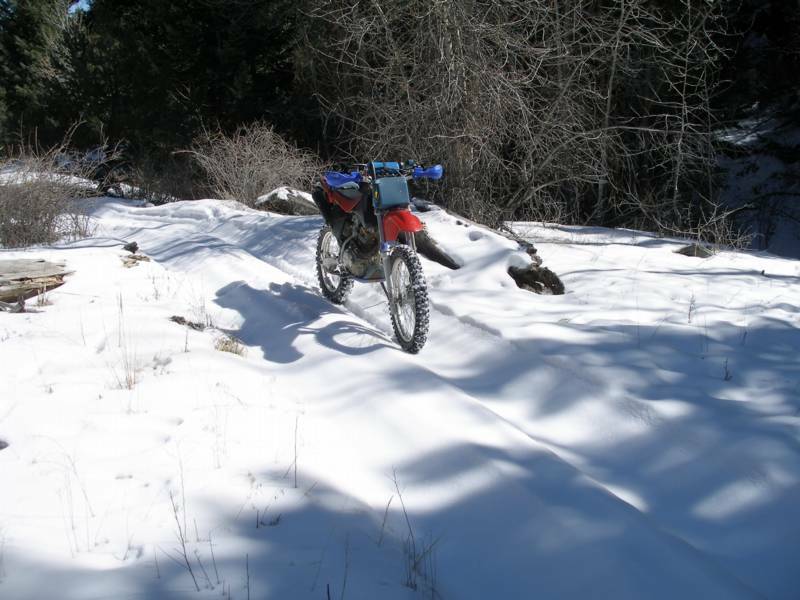 Better wait for warmer days. 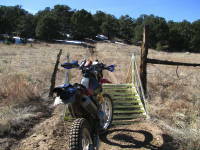 I rode at Texas Cr today. 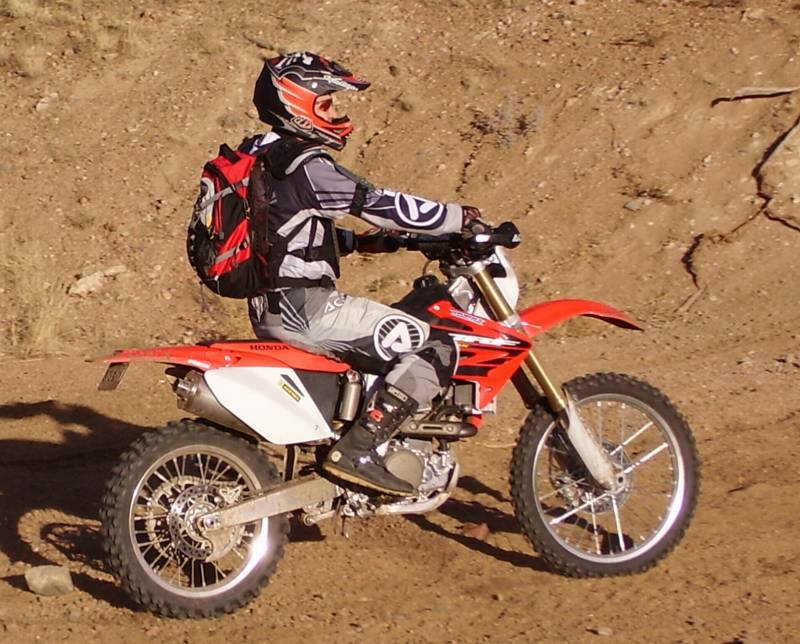 Got a nasty flat in the main arroyo while riding my CRF230F - hit a rock and tore a chunk out of the front tire. Limped back to my van and switched to my TE610 and did a little exploring south on SH69 - lottsa snow down that way. 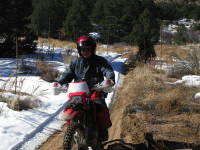 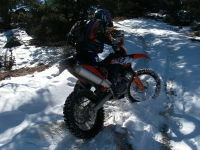 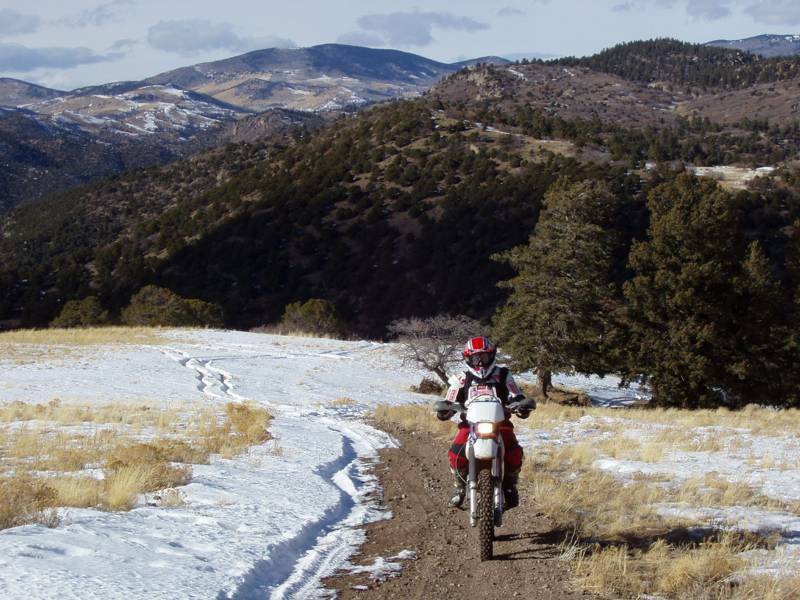 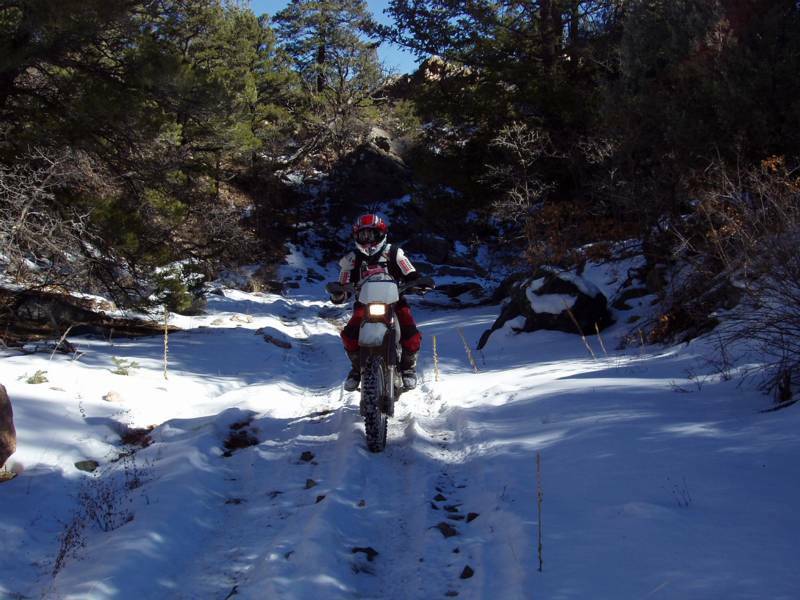 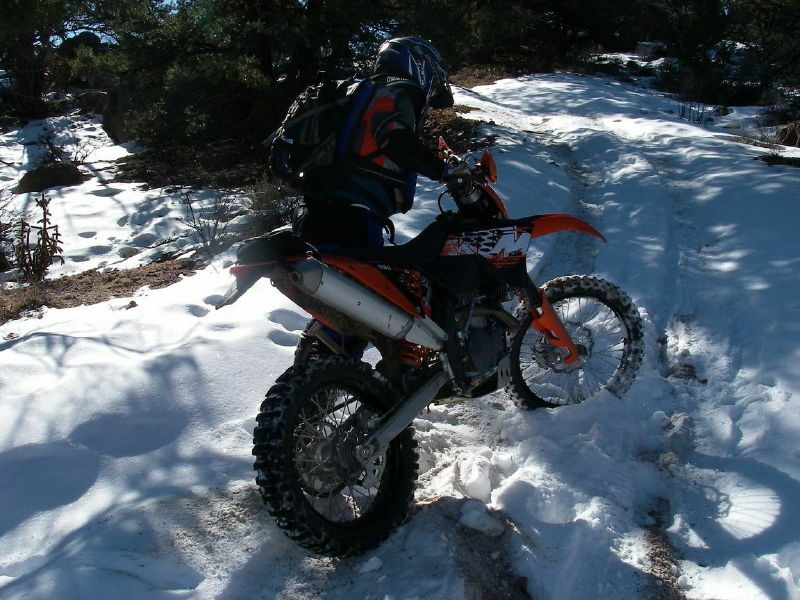 Afterwards, I met some riders from the front range who had ridden quite a bit of the OHV area, despite the snow. 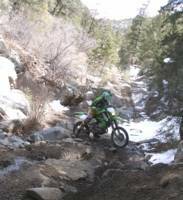 They kindly allowed me to post some of their pictures below. They had FUN! 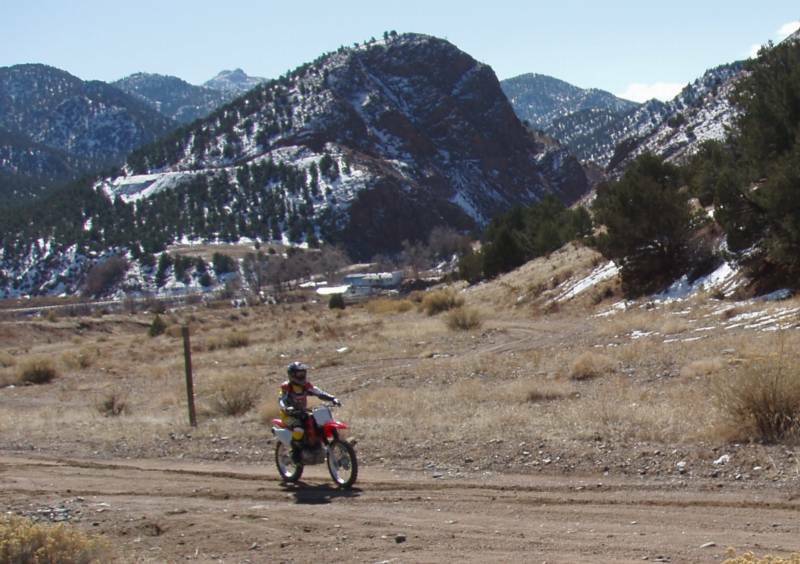 I rode by myself today because all my riding buddies were busy: two went skiing, one went snomoing, one painted his house, and one had to cut a load of fire wood (wha?). 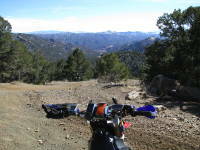 It was very warm; mid 60s by the end of the ride. 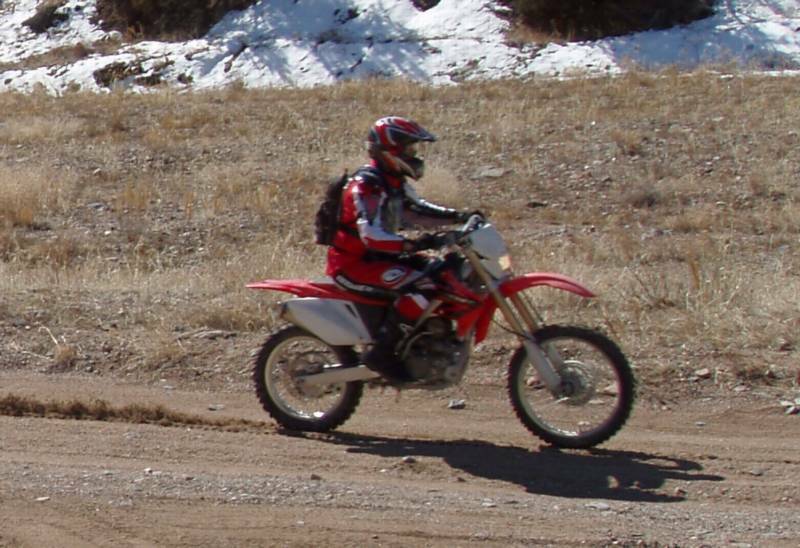 I'm wearing summer gear now. 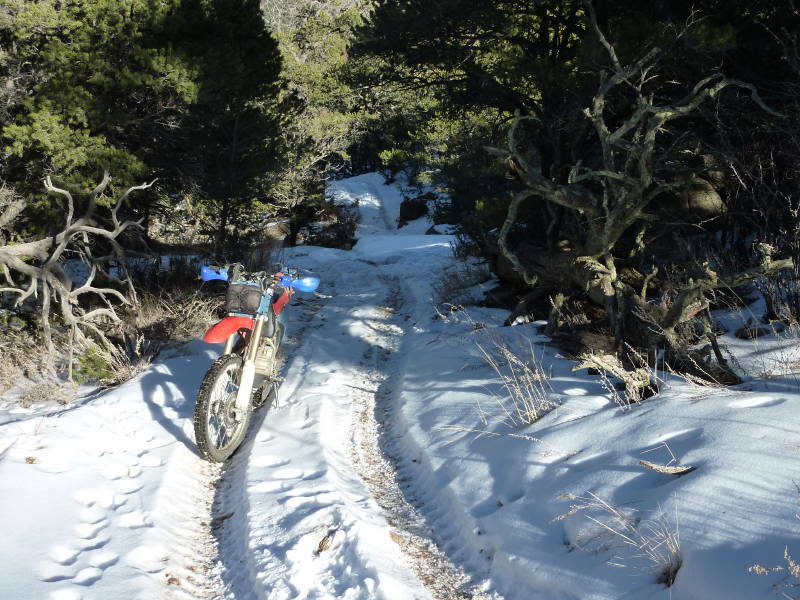 Despite the warm weather, there is still snow and ice. 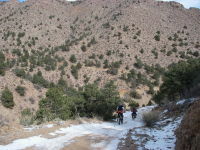 I rode 29 miles, about 1/4th of the area. 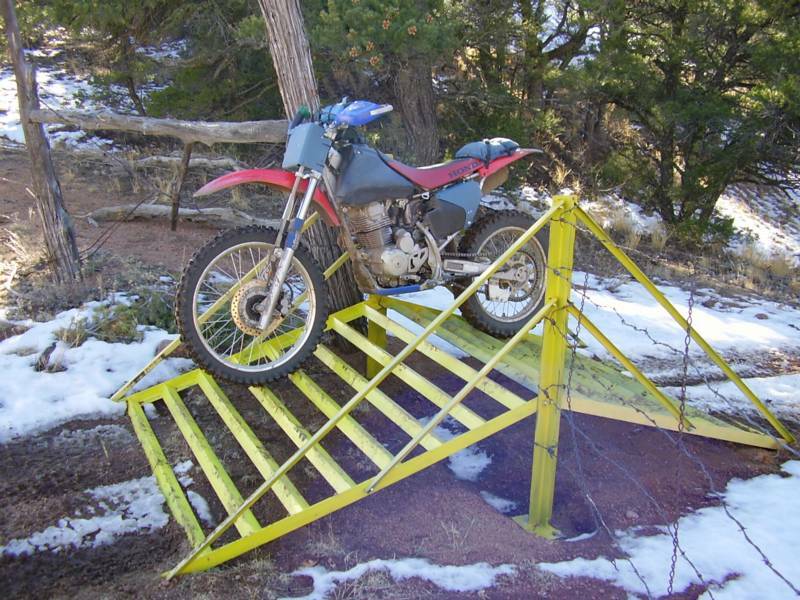 The cattle guard on the east side of Waterfall Loop at the top end of Reese Gulch. I had to turn back before reaching the rocks; too much ice. 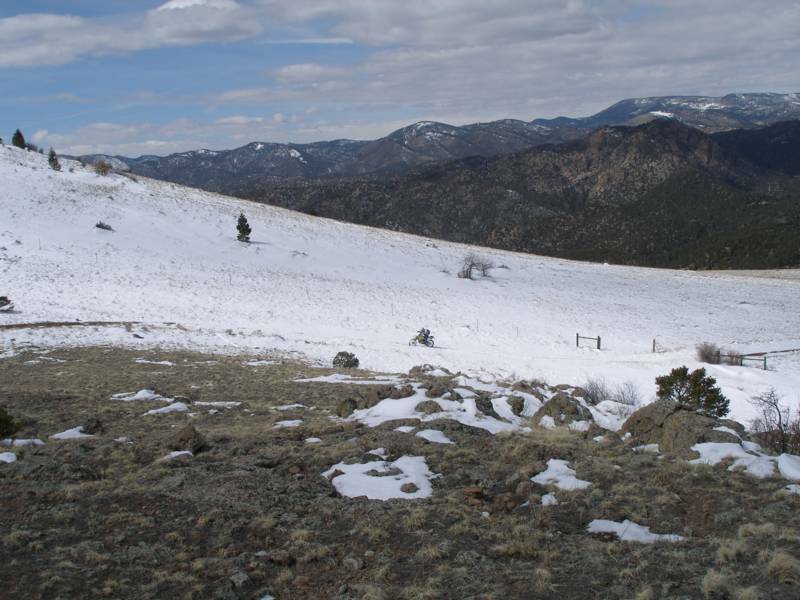 The snowy and cold winter (so far) has left snow on the ground at TC a bit longer than usual. 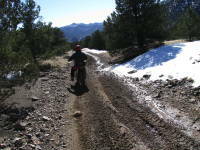 On our ride today we encountered mud and snow on every route we tried. The main sandy gulch was nice and tacky until we got to the snow and ice. but it wasn't bad at all. 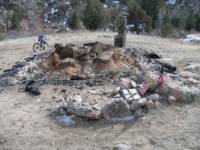 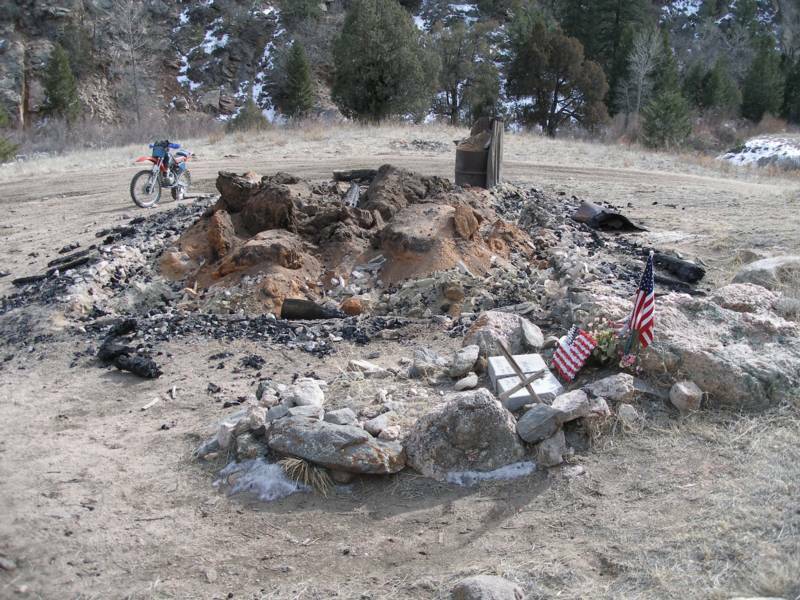 Sad to say, but the cabin next to Sgt Nulph's grave site was burned by persons unknown. 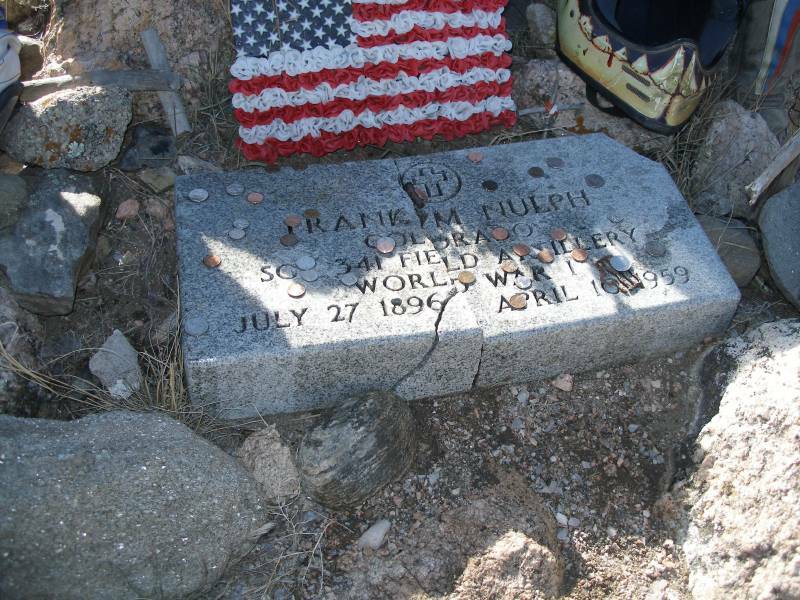 The grave site remains, but the jerks took the coins off the marker stone. 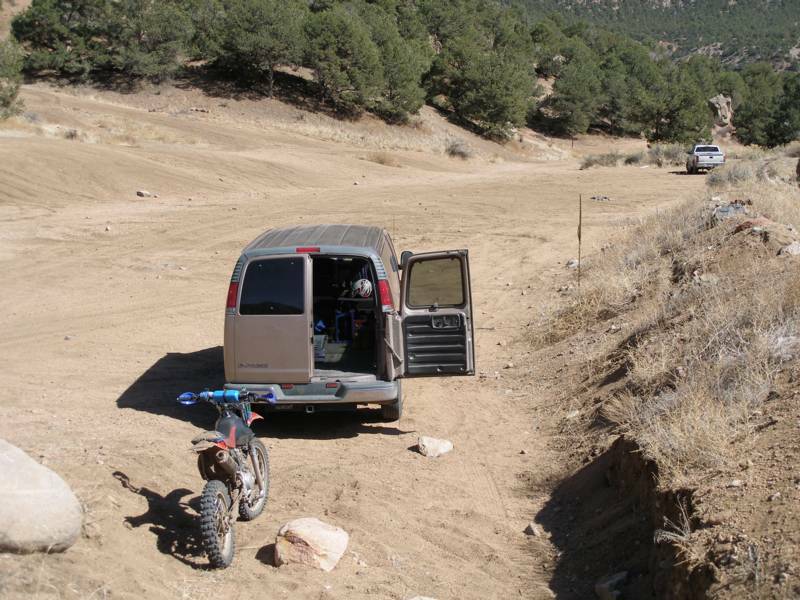 Lonely pit area - there was me and a dog (by the pickup)! 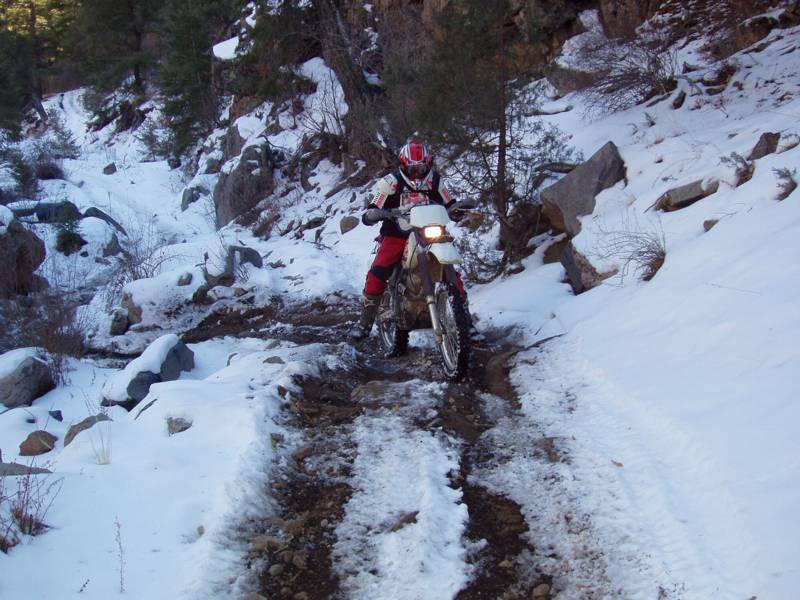 January 30, 2004 - We found snow in the dark canyons and on the north sides, but nothing that stopped us.